Stories of the rise and fall of hustlers attempting to grab hold of the American dream have been told time and time again in cinema. What makes director Yann Demange’s WHITE BOY RICK stand out from the expected are the unexpected ways he approaches the material. Instead of running at a rehearsed, kinetic pace, the filmmaker prefers naturalistic, character-based dramatics. Based on the real life story of Richard Wershe Jr.’s tumultuous few years spent as an FBI informant, this character study refocuses the lens on one family’s desperate struggle to rise above their surroundings when the odds are constantly stacked against them. He was the youngest FBI informant ever. By the age of seventeen, Rick’s (Richie Merritt) life had already accrued enough explosive diary entries to amass a salacious memoir, yet he still had more records to set (like the most jail time served for a juvenile drug offender). He was recruited three years prior by FBI Agents Snyder (Jennifer Jason Leigh) and Byrd (Rory Cochrane) and Detroit narcotics squad officer Jackson (Brian Tyree Henry), essentially blackmailed to work as an undercover drug informant or else his father Richard Wershe Sr. (Matthew McConaughey) would face stiff jail time for illegally selling guns. Rick complies, but – as people in these sorts of situations often do – he finds himself in too deep, caught up in the lure of easy money. And with his back up against the proverbial wall, he goes into the business, dealing drugs for his own gain. 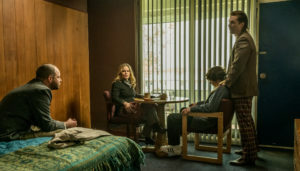 Matthew McConaughey, Jennifer Jason Leigh, Rory Cochrane, and Richie Merritt in WHITE BOY RICK. Courtesy of Sony Pictures. Unfortunately, Demange’s picture rushes through the most intriguing and infuriating real-life events – when those same government agents, who swore to protect the teen, abandon him in his time of need. Later, it relegates a few of those important details to end title cards, leaving the audience to ask more questions. As consequence is an important theme of the film, the first two acts could have been condensed in favor of exploring why Rick was forced into longer jail time than many others in the case. They had time enough to broach the subject of white privilege (something that, while resonant and necessary to hear, ultimately does not affect Rick’s sentence), so why not bolster the third act a little more with the injustice that was dealt? We’ve certainly seen a plethora of undercover informant and white male hustler stories before, but none are quite like Demange’s film. His has more of a 70’s-style edge where character comes first. Production designer Stefania Cella and cinematographer Tat Radcliffe’s work aids in that feeling, not just in Rick’s dizzying seduction of the Curry Crew’s effused world filled with saturated colors (demonstrably seen at the skating rink and in Las Vegas), but also in the Wershe family’s sobering quiet, or bleak moments emphasized by an earthier color palette. Whereas films like BLOW and AMERICAN MADE are big on Scorsese-influenced high-energy cuts, breakneck pacing and needle drops on a rock n’ roll-fueled soundtrack, they also highlight how their protagonists fail their families as husbands and fathers. Demange, along with screenwriters Andy Weiss and Logan and Noah Miller, plucks those same emotional chords in the Wershe family with a tad more emphasis – cinematically nurturing the relationships between father and son, father and daughter, sister and brother. Occasionally, their family dynamics are similar to those featured in David O. Russell’s canon, where they find function in dysfunction. Bruce Dern and Piper Laurie, playing Rick Sr.’s neighboring father and mother provide that levity. There’s also a little narrative cross-over with DONNIE BRASCO where the line between criminal and informant is blurred, leading to a conflict within the character. Since the characters take center stage in this film, the performances stand out that much more. Powley, playing Rick’s troubled-but-caring sister Dawn, brings a fierceness to her character’s fragile cherubic beauty. Merritt hints at his character’s arrogance cloaking his youthful naiveté. 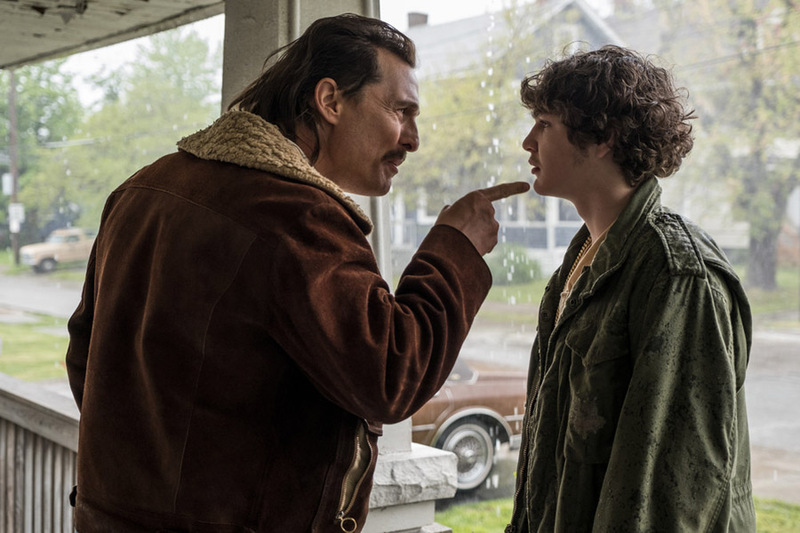 McConaughey’s gives a heartrending turn as the father trying to keep it all together when hope is hanging on by a thread. His work here is so precise it can cut glass. The backdrop of Detroit (a city typically portrayed in cinema as one in decay) in the mid-eighties during the height of the crack epidemic provides ample territory to explore the narrative’s themes of personal ruin, and echo the characters’ crumbling and disillusioned perspectives. WHITE BOY RICK presents a fascinating dichotomy where the audience roots for the protagonist to succeed, but also forces us to face a complex, sobering reality. 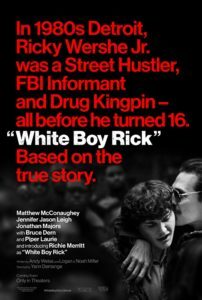 WHITE BOY RICK opens on September 14.